Is 100mm of concrete enough in air-conditioned buildings? A question often asked by architects and designers is: "Will 100mm of concrete provide enough thermal mass?" In air-conditioned buildings the heating/cooling cycle is generally limited to 24 hours because the tighter control of temperature should ensure there is no build-up of heat in the fabric over periods longer than a day. This might suggest that 100mm of concrete would provide the optimal level of thermal mass needed to reduce the air conditioning load. Whilst this may be true for a simple, flat concrete floor slab exposed on one side (i.e. the soffit), in practice slabs are often exposed on both sides and/or internally. This greatly increases the surface area for heat absorption and the effective depth of concrete that can be utilised in a 24-hour period, which in turn significantly increases the cooling capacity provided by the slab. This is commonly achieved by combining an exposed soffit with underfloor mechanical ventilation, enabling heat transfer from top and bottom surfaces of the concrete slab. Similarly, another option is to have an exposed soffit in conjunction with hollow cores within the floor through which air is channelled, which is another way of maximising the heat transfer area. This technique forms part of the building’s mechanical ventilation system, which has the added benefit of ensuring air passing over the concrete is relatively turbulent, greatly increasing the rate of heat transfer at the surface and, as a consequence, the depth heat will penetrate during the daily cycle. It is worth noting that the 100mm benchmark sometimes quoted, assumes the use of natural ventilation i.e. smooth/laminar air flow at the surface, resulting in a much lower rate of heat transfer. A further active cooling option that is increasing in popularity is the use water rather than air to regulate slab temperature, made possible by embedding chilled water pipes in the soffit. Heat flow between the water and the concrete is by conduction, making it relatively rapid and enabling all the available thermal mass in the floor slab to be exploited. So, in conclusion regardless of whether a passive or active approach to cooling is used, the thermal mass in concrete floor slabs with depths well in excess of 100mm can be fully utilised to maximise cooling output and provide enhanced performance during hot conditions. The suggestion sometimes made that a 100mm of concrete provides sufficient thermal mass is too simplistic and fails to take account of how floors are actually used in practice and the range of conditions under which they must operate. 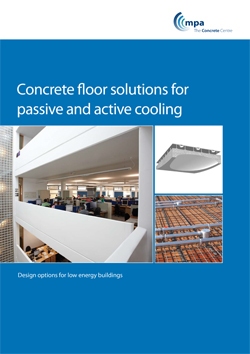 For more information download Concrete Floor Solutions for Passive and Active Cooling.